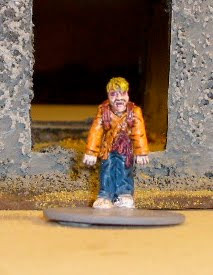 Baconfat Log: Zombies, Rocket Crew, Cannon, Abandoned Buildings, and Terrain. Zombies, Rocket Crew, Cannon, Abandoned Buildings, and Terrain. I've slapped paint on few more zombies. I'm up to 38 complete with another 30 something in the works. First up, is a zombie child. It's a USX miniature which I believe is actually RAFM. The line is actually quite large, maybe 32mm scale and full grown USX/RAFM zombies probably won't be added to the pack. They dwarf some of the prepainted Horrorclix stuff. Regardless the undead child is in, because child zombies are very rare. 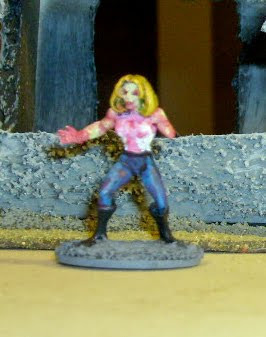 Second is a Heroclix Invisible Woman that's been chopped up and painted undeadish. I find myself forced into killing superheros to get a more fair ratio of female to male zombies. I shaved off her Fantastic 4, painted her a white tank top, touched up her pants and boots, stabbed her a bit, chopped off half an arm, and liberally applied blood. Heroclix actually are quite easy to zombiefy because of their soft plastic and prepaint equals priming to me. Thirdly are two terrible prepainted sculpts. 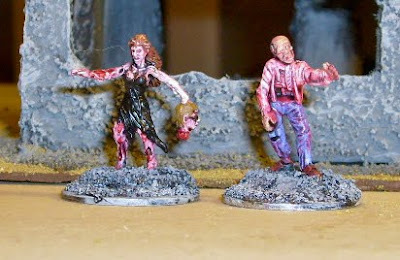 I believe they are for Dungeons and Dragons, but zombies are zombies and prepaints save time. All I did was dip them in wood stain to hide the sweat shop labor paint job and paint their bases gray. Zombies don't need to be pretty. Here are two Mantic brand ghoul models. 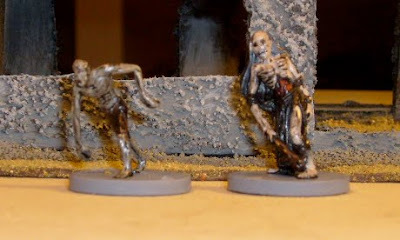 I saw a advert on theminiaturespage.com come that Wayland Games was offering free Mantic ghoul samples. Free is good. 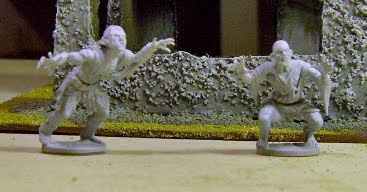 These ghouls had extrabits and are sculpted quite well. The downside is they had weird horns growing out of them (about three each) and what appeared to be railroad spikes randomly stuck in them. They were easily removed. I also removed some of their clothing, because they were both wearing skirts. Skirts would be fine if I was creating a Scottish zombie horde. They'll be a fine addition to the pack. Due to the fact I'm painting these zombies for the Zombies board game, I painted uptwo of the official Zombies miniatures. They are very small compared to the rest of the pack members, but it seemed right to include a couple. People come in different sizes. Here is an Old Glory British rocket crew. There done wether they really are or not. The little yellow straps all over their jackets was infuriating. I also have no idea what color the furry trim of the officer's jacket should be. I couldn't find any Osprey books or online pics to help. Yellow and white looked silly; so the trim ended up gray. I'll paint some rockets for them to shoot soon. Below are some artillery pieces I've been working on. I painted the Victrix British cannon ages ago, but only recently based it. The other two are Prussian guns. The crew will be done soon and posted. Here are two abandoned buildings that are nearing completion. I am going to make sidewalks out of thin foam board and throw in a little rubbish. You may notice there's a severe lack of rubble. I don't think I like painting rubble. 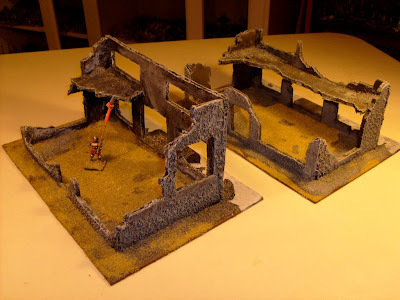 I'm going to try and make some red brick buildings next and I'll make some rubble for that. 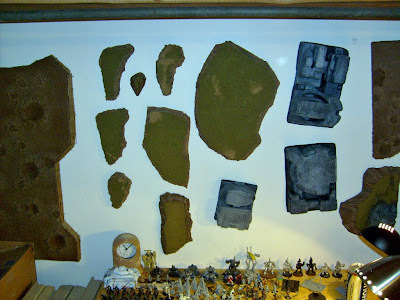 Lastly, I thought I'd show my one subscriber how I store my flat terrain. It's hanging on the walls wherever there's not shelves of little tiny toy army men in the way; but one picture of one wall will suffice. I simply carve little chunks out of the foam bottoms. They sit quite well on a nail in the wall.